As 2016 comes to a close, it’s a great time to look back at all the accomplishments of the year. If you’re an investor, whether you invest in real estate or in stocks and bonds, it’s a perfect time to reflect on what worked and what didn’t with an eye toward the future. It’s good to celebrate your successes, learn from from your mistakes, and keep moving toward your goals, whatever they may be. 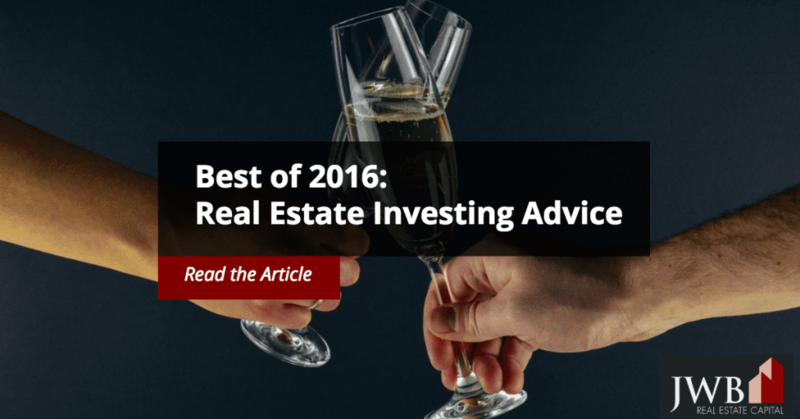 We hope that the posts we’ve shared here on the JWB turnkey real estate investing blog have helped make your 2016 more prosperous as you’ve learned about passive income, investing, real estate trends and more. So, before we embark on the new year, let’s take a look back at some of our favorite blog posts from the last year, the best of 2016.
Who doesn’t want to retire rich? Of course, there are a million different get-rich-quick schemes out there that promise to help make that dream a reality, but if it were that easy everyone would be sitting pretty when it’s time to retire. Real estate could be the key to making it really happen. Here’s how. Think passive income takes a huge financial investment? Here are five proven passive income strategies that take minimal funds and minimal effort. We all know how important it is to pay off our debt, but we also know the sooner we put our money into an investment the more time it will have to grow and flourish. So, which should you do first? The answer depends on your situation. This guide for beginning investors, Investment Properties for Dummies, demystifies the process of buying and managing investment properties. Good investment property companies are more than a helpful, time-saving resource–they are vital to your success as a turnkey property owner. Here’s why.